The closing of the Caminito del Rey without a reopening date has caused consternation (and anger) among area hoteliers, hardened explorers, restless German tourists and run-of-the-mill enthusiasts. Few people know this, because such things seldom receive coverage in the media, but it turns out that ever since the hazardous trail was reopened, with the inevitable boom in tourism, UFO sightings have been on the rise in Valle del Guadalhorce. It's not a joke, as far as such a thing cannot be taken as a joke. There are ufologists studying the matter and videos on the subject can be found in YouTube, recorded in broad daylight. Some of them are dastardly fakes, but others are a source of curiosity. Most of the sightings were concentrated between February and June of last year, and as always, eyewitness accounts vary: some define the objects seen as disk-shaped and others describe them as white lights. Add to this the stories put forth by bloggers who go on about some "white brotherhood" with underground bases in the province, who sometimes come out for a breath of fresh air and to take a peek. Anyone who wants their daily dose of madness can serve him/herself (it's advisable, for sure, but be careful). Remarks from those who can be described as 'normal folks' can also be found. These appear not to be on the hunt for notoriety and restrict themselves to say that they've seen something, without added interpretations. These things are of great interest to this writer, who is a lover of science-fiction and unsolved mysteries, but even more so a lover of Western Civilization as a powerful mechanism for contrasts. The reasons that lead someone to make up such stories, or describe something flying in the sky as a UFO, are always worthy of analysis. When speaking of these things, I always recommend "Azul y pálido" (Blue and Pale), a graphic novel by Pablo Rios, a fascinating immersion into the 20th century's most popular contactee episodes (featuring Carl Sagan as a master of ceremonies). It posits many questions and the reader is asked to put forth his/her own answers on the table. But back to the story: if the dates agree as they appear to, we may conclude that residents of some distant world have been seduced by the incomparable natural beauty of El Chorro and have come to take a look. If you've ever seen a strange-looking tourist along Caminito del Rey, you know what's going on. Always smile at tourism. Much benefit could be obtained from this UFO stuff. I don't know whether such a thing as UFO tourism exists, but a pioneering endeavor could be developed by the authorities. This would perhaps fit into the whole Sabor a Málaga thing, I say. There must be some building in downtown Malaga that can be used to create a museum to distinguished aliens, ranging from Emperor Ming to Commander Spock. The El Chorro station could feature a detailed interpretation center devoted to Stanislaw Lem or Frederick Pohl. 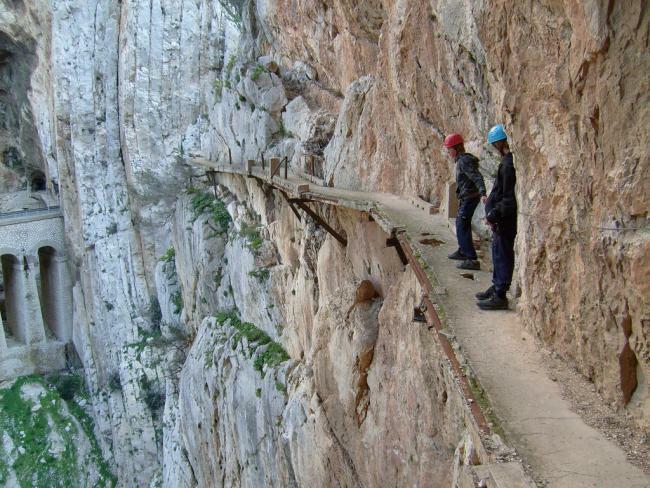 If the UFO situation is real, perhaps the closure of Caminito del Rey is due to the construction of a landing platform for our hitherto unsuspected visitors. When it comes to promoting Malaga, the atmosphere shouldn't be the limit. Chile: Ghosts on a Bus? Argentina: A Community of Earthbound "Pleiadans"?